When you first start the game, the main menu and the main screen are shown. If you move the mouse over an item on the main menu, it will be highlighted. Clicking on an item will take you to the designated section (e.g. Sell Out on the picture below). 2. Net Worth: The total net worth of all your assets, including cash, crude oil, products, land, etc., minus your debts. 3. Cash: This is the amount of cash you currently have available to you for purchases. 4. Crude in Stock: The amount of crude you have in stock, either from importing or from your land plots. 5. Plots: The total number of plots you own in every county. 6. Oil Wells: The total number of oil wells you have drilled successfully in every plot in each county. You start out with 1 well on your plot in Lampassas County. 7. Crude Reserves: The amount of crude available to you in all the plots you own. This shows whether you are using your land plots efficiently or if you need to drill more wells. 8. 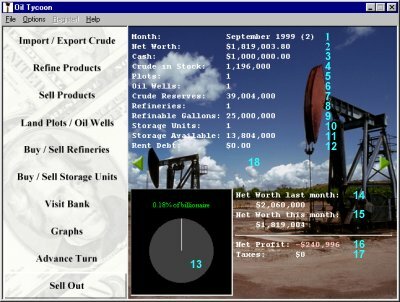 Refineries: The number of refineries you own. Each refinery can refine up to 25,000,000 gallons of crude each turn. 9. Refinable Gallons: The amount of crude you can refine in this turn. This is equal to the number of refineries times 25,000,000 minus any crude you have already set up to refine this turn. 10. Storage Units: The number of storage units you currently own. Each storage unit can store up to 15,000,000 gallons of crude or products. For information on renting storage and crude repossession, click here. 11. Storage Available: The amount of storage you have available for additional crude. This is equal to the number of storage units times 15,000,000 minus any crude or products you already own. 12. Rent Debt: The amount of money you owe for renting storage because you did not enough cash by the end of the turn. For information on renting storage and crude repossession, click here. 13. Percentage of Billionaire graph: Displays your net worth in relation to your goal to become a billionaire. 14. Net Worth Last Month: The total net worth of your assets in the previous month. 15. Net Worth This Month: The total net worth of your assets this month. 16. Net Profit: The amount your net worth increased or decreased after you had advanced the turn. A negative net profit indicates you lost net worth. 17. Taxes: The amount of taxes you owe. This is a flat rate 33% of your net profit. If you have a negative net profit, a tax credit is extended for future tax expenses. Plot Name in County has been depleted: A plot that you own has been completed depleted of oil reserves. Once a plot is depleted, it is automatically put up for sale. After one turn, the plot will be sold, and by the next you will receive the value of the plot in cash. Loan for Date has been paid off: A loan you applied for at the bank has been paid off. It takes 12 months to pay off a loan. You missed a payment for the loan on Date: This indicates you did not have enough cash by the beginning of the turn to make the payment for a loan. As a consequence, your credit rating will decrease, and you will be unable to get as much of a loan the next time you apply. If your credit rating is a D and you miss another payment, the bank will begin to repossess some of your assets, including crude oil, products, refineries, etc. Your credit rating increases once every 6 turns. You are currently renting storage for x gallons of crude / products: You do not have enough storage available by the end of the previous turn to store all the crude and / or products you currently have. You are therefore forced to rent storage, which costs $0.015 per gallon per turn. You currently have negative net worth: Your net worth is below zero due to excessive debts above your current assets.